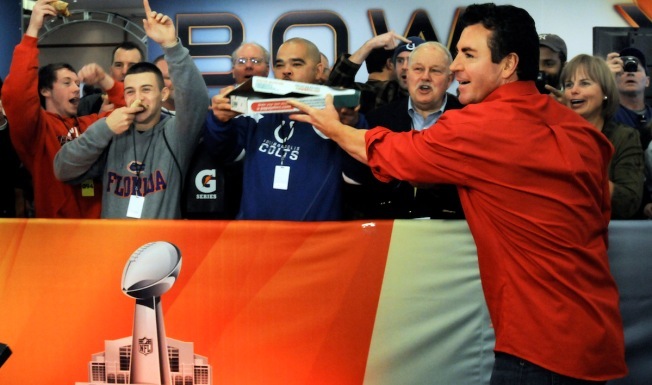 In this file photo, John Schnatter, founder of Papa John's, celebrates America's call of "heads" in Papa John's Super Bowl Coin Toss Experience with NFL fans during Super Bowl XLVI pre-game activities in Indianapolis, Thursday, Feb. 2, 2012. Papa John's announced it would no longer be an official sponsor of the NFL on Feb. 27, 2018. Papa John's is ending its recently stormy role as an official sponsor of the NFL. Officials at the pizza chain said Tuesday that the two sides agreed to end the relationship, which became strained last year when its founder John Schnatter criticized NFL leadership over national anthem protests by players.